Outwardly, Marta and Hector Bjornstad’s long marriage appears tranquil, harmonious, happy. So why is Marta having visions nobody else sees? Norwegian housewife Marta Bjornstad is bored and bereft following her son Kylan's leaving home to attend university. The days are long, filled with too many empty hours before husband Hector returns home from his teaching position, expecting a spotless home and hot supper. Hoping to create a rupture in her anxious schedule, “something bad” inciting Kylan’s return, Marta stops taking her pills. She does so furtively, for Hector monitors her medication closely, often administering it himself. Now Marta spits out the pills Hector feeds her, enjoying her deception. After this, something bad does happen. It's easy to label Emma Chapman’s fast-paced, tautly written debut a thriller. 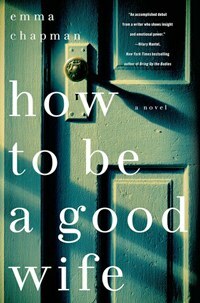 More than a whodunit, How to Be a Good Wife examines the warped power dynamics of a marriage that should never have happened, and what happens when a woman tries to gain freedom. This is a book that can be taken on two levels: the escapist read or the more serious look at the ways men continue to oppress women. Outwardly, Marta and Hector Bjornstad’s long marriage appears tranquil, harmonious, and happy. Yet the novel opens with Marta holding a lit cigarette, puzzled. Where did it come from? She does not smoke. Thus, the reader enters her waking nightmare. Marta was only 21 years old when she married Hector. Her mother-in-law’s wedding gift was a domestic manual sharing the book’s title. This old-fashioned, ridiculously chauvinist text would be laughable if it didn’t epitomize Hector’s expectations: be pretty, neat, cheerful. Keep the house immaculate, the children quiet. Defer to your husband in all matters. Serve nutritious, economical, tasty meals. Two decades into her marriage, Marta is able to recite How to Be a Good Wife’s stern admonitions from memory. Windows are scrutinized for smudges, furniture dusted, clothing washed and ironed. Marta is especially particular about shopping. The refrigerator is packed from her daily shopping excursions: "I couldn’t fit anything else in it if I tried, but I still like to go to the market at one o’clock every day. It is a habit I can’t seem to break." Strangely, the otherwise controlling Hector tolerates this quirk. He keeps How to Be a Good Wife in his study, a room Marta is forbidden entry. Hector is 20 years older than Marta. He often speaks of how they met, claiming he opened the door one morning to find an emaciated girl curled on his doorstep. Hector lifted Marta inside and nursed her to health, feeding, bathing, and clothing her. Each recalls, with differing interpretations, visiting a hairdresser who cut Marta’s messy, tangled hair. The couple married in a small ceremony, Hector’s home became theirs, and Marta had Kylan. Hector likes caring for Marta, despite her rocky mental health. If he is demanding regarding the house, if his hovering watchfulness annoys, Marta reminds herself what a good provider he is, and that he saved her -- yet she is not certain what Hector saved her from. Marta’s memory of life before Hector is hazy. Her parents are dead. She has neither friends nor relatives. There is only her strained marriage, frenzied housekeeping, and missing Kylan. Unable to sleep one night, Marta wanders into Kylan’s bedroom. Instead of her son’s bed, Marta sees a girl clad in ballet slippers, begging for help. This distressing vision vanishes, but only briefly. The girl reappears in various states of dishevelment. Her weight vacillates. Sometimes her hair is clean. More often it is dirty. Sometimes she is smoking. Marta is certain she is going mad, but as scraps of memory surface, she realizes the opposite is occurring. Gradually, her fragmented recollections cohere. Life before Hector reasserts itself into a horrifying whole. The journey to complete recollection is often unsettling, sending Chapman into territory Claire Messud tread with The Woman Upstairs: that of the dislikeable narrator. Messud’s Nora Eldridge, an unmarried, middle-aged woman, has the temerity to admit her rage at being exploited. Nora unnerved a few readers and critics, who attacked Messud for creating her. Although Marta has moments of abominable behavior, Chapman has escaped media censure. This character’s mental health is so fragile that even at her worst, the reader never loses sympathy for her. In a painful passage, Kylan sends word of a visit, launching Marta into a manic round of preparations. Ingredients are gathered for Kylan’s favorite dish, and the closet searched for the perfect outfit -- all the while the girl slips in and out. The past presses unbearably on the present. The evening goes irretrievably awry even before Kylan removes his coat. Matters worsen when he announces his engagement to the beaming Katya. Flooded with memories of her own nuptials, Marta is every inch the overbearing, possessive mother, unable to part with her son. Mother-in law Matilda’s needless criticisms only fuel the agonizing evening that follows. The reader is caught between sympathy and disgust, particularly for Katya. The couple departs early the next morning. Kylan’s departure creates space for the girl to reveal the final bits of memory. Marta attempts to seek help are met with widespread disbelief. Worse, she is thought insane. Trapped, lacking choices, Marta Bjornstad reasons her way to a devastating conclusion. At the close of How to Be a Good Wife, Chapman offers a list of influential novels. Seminal feminist Charlotte Perkins Gilman’s The Yellow Wallpaper tops the list, followed by Margaret Atwood’s The Handmaid’s Tale and Edith Wharton’s House of Mirth. Certainly all the narrators here -- interestingly, two are nameless -- share similarities with Marta Bjornstad. Some may find Marta’s experiences reminiscent of the volatile Lisbeth Salander. Literary merits of The Millennium Trilogy aside, Stieg Larsson was ardently feminist. The inevitable comparisons to Emma Donoghue’s Room don’t quite align: that fine book was narrated by a child. Chapman also found Virginia Woolf’s A Room of One’s Own a notable influence. Her favorite work off all, though, is Sylvia Plath’s The Bell Jar. The nameless narrator of The Yellow Wallpaper went insane. The nameless narrator of The Handmaid’s Tale was last seen getting into an unmarked vehicle, destination unknown. Edith Wharton’s impoverished, sleepless Lily Bart overdoses on Chloral. Virginia Woolf had a room of her own, but it didn’t suffice. Sylvia Plath’s Esther Greenwood survived her ordeal. Plath did not. Tragically, depression’s genetic nature reasserted itself 2009 when Plath’s son Nicholas took his life. The Martas of the world exist. Their circumstances ensure their ready dismissal. Called hysterical, crazy, or worse, they are prescribed SSRIs, given the psychiatric label du jour and returned to their torturers. It is easy to pick up How to Be a Good Wife, find it an entertainment, then quickly forget it. Perhaps less entertaining is a writer under 40 years old whose recommended reading list is all women -- narrators, authors, or both -- who suffered and died under male oppressors.